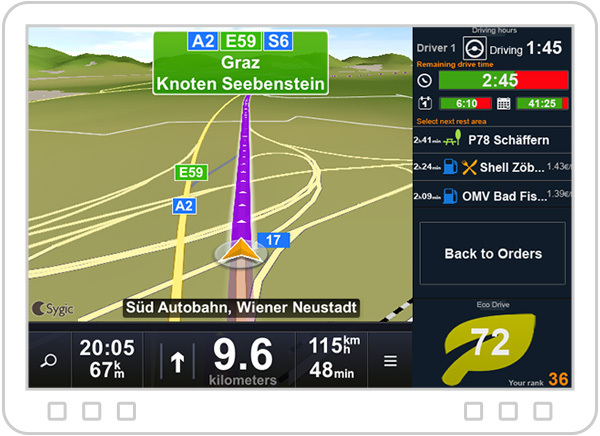 Sygic Truck Navigation is not just a navigation app anymore. The latest release of Sygic Truck Navigation turns it into a comprehensive solution interface optimized for the needs of drivers. Thanks to the Sidebar API introduced with the latest Sygic Truck Navigation version 13.5.0, drivers can have information from other applications or telematics systems always visible on the navigation screen, eliminating the need to switch between different apps. The Sygic Navigation Sidebar can display information like driving time, driving behavior, tasks to perform or messages from the dispatcher to prevent distractions during driving caused by switching apps. The Sidebar even goes beyond simply displaying information. It allows users to interact with it by merely tapping on the display to access various functions of the fleet solution. With this simple solution, Sygic Navigation Sidebar improves the user experience across the whole solution, and makes fleet operations safer. Displaying data from vehicle-based hardware is also possible, allowing the driver to focus on his driving style and behavior. The brand new Sidebar feature is aimed at helping FMS providers integrate their software with Sygic to create even more integrated fleet solutions. By allowing any component of the fleet solution to be accessible on a single user interface, the need for integrators to develop a split screen application is eliminated. The widgets support personalization so the solution can be properly branded and respect the visual identity of the solution provider. This way we can achieve harmony between various components, leaving space needed for effective navigation. Manufacturers of vehicle hardware components that have no accompanying tablet app can use Sygic Navigation Sidebar to allow drivers to interact with their hardware. The picture shows an example of the sidebar layout, where the widgets are displayed on a sidebar suitable for a truck fleet solution. The sidebar is located on the right side of the navigation screen, taking up about 25% of the screen width, and is only available when viewed in landscape mode. The sidebar can consist of four equally sized widgets, or a combination of widgets where one or two of the widgets are double-size. There are 3 types of widgets that can be used to visualize data and provide user interactions with the click to callback mechanism. Fleet solutions can define the widgets and change them dynamically. This widget displays one or two buttons within a defined formatting. This widget supports simple HTML style formatting of text in multiple lines. This widget displays a single PNG bitmap. The API also offers functions to design callbacks to receive user actions allowing active buttons to be placed in the sidebar. We also offer custom sidebar widgets development. For detailed Sygic Navigation Sidebar API documentation, please follow this link. The Sidebar API is available through a license key. One license key is provided to each integrator. An application containing the license key can activate the sidebar in any business navigation app from Sygic. If you can’t wait to start developing your own sidebar for Sygic Navigation, just ask us for a separate trial key and trial license of Sygic Truck Navigation here.